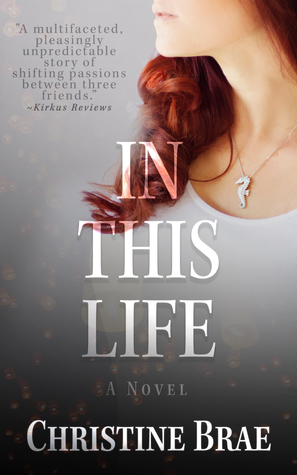 In Christine Brae's In This Life, Anna Dillon and her best friend Dante go on a medical mission trip to Thailand before she enters medical school. While there, she meets Jude Grayson and they have a brief but passionate affair. Though he promises to keep in touch, he never does. Anna can't quite get over him, and tries to move on with Dante. This almost works, but then she encounters Jude again by chance and her old feelings are reawakened. The emotions conveyed in this book are so raw and almost uncomfortable to read at times. There's no "hero" in the book; they are all flawed and approachable in different ways, recognizably human even as they try to improve. "It wasn't a love triangle; she wasn't confused, nor was she apologetic. She set out to prove to the world there are different kinds of love that can only be experienced once in a lifetime." Anna is confused, though. There is love for two different men, in different ways, and she can't reconcile her own feelings with what she believes she should do. Read an interview with Christine Brae and remember to enter the mystery box giveaway below that Christine Brae is sponsoring along with Girl Who Reads.